At a time when all of Shakespeare’s plays are being staged in different places on different kinds of stage in thirty-seven different languages I’m thinking about how different the staging of Shakespeare’s plays are from when Shakespeare wrote them to be staged in his own Globe Theatre. Very often, these days, when you attend the theatre you’ll be sitting, facing the stage square on. It will usually have a proscenium arch that frames the it like a painting so the action presents itself to you as a moving picture. Modern audiences have a taste for realism so the sets represent the kind of scenes we are used to in our real world life. A scene may take place in a dining room, for example, and will be set up and decorated as a dining room, with chairs, table, real food and so on. The next scene may take place in a forest, and there may be trees, and lights representing the sun filtering through leaves. Perhaps the next scene takes place in a bedroom and it will be a recognisable bedroom. There will be windows, doors to balconies, fireplaces internal doors and so on. At the end of a scene there will usually be a blackout, during which the actors can leave silently and the set can be changed. All that would have been nonsense to Shakespeare’s audiences. The playwright – and all the other Elizabethan and Jacobean playwrights – wrote in a way that encouraged the audience to imagine the sets. Sets used in the modern way I have described makes the stage inflexible, whereas the Elizabethan stage was completely flexible. The empty space, that was extended out into the audience and could be viewed from three sides, could be a small prison cell, a battlefield, a royal court, a crowded city street, an ocean, and any other place, in rapid succession, without changing a thing. There were some concessions to realism in Elizabethan plays, though, and we can see how Shakespeare had some practical staging considerations in mind as he wrote his plays. For example, when Hal kills Hotspur and goes off, leaving the body on the ground, Shakespeare has Falstaff find it and decide to claim that he has killed him. Falstaff carries the body off the stage. When Hamlet kills Polonius, he drags the body off, allowing the next scene to take place somewhere else, without the dead Polonius lying in the wrong place. Those playwrights always contrived ‘realistic’ ways to remove bodies. In the modern version the dead body just gets up and walks away during the blackout. 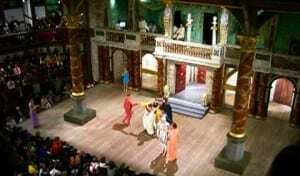 There were certain design aspects of the Elizabethan stage that offered some realism as well. The upper gallery could be a tower, a battlement, a bedroom window, a hilltop or, most famously in Romeo and Juliet, a balcony. But it was just a gallery, always the same: the playwright used language to dress it up as a battlement or a hillside and the audience’s imagination would complete the illusion. It was occasionally necessary to have a piece of furniture in a scene – for example, the very important bed on which Othello murders Desdemona. In that case the bed would be on the rear stage, concealed by a curtain until the time came to act out the scene. The rear stage could also be used to do such things as reveal a surprise, both to the audience and one or more of the characters. In A Winter’s Tale when the statue of Hermione comes to life the actor has been waiting patiently on the rear stage for the curtain to be drawn, revealing him (it would be a boy) as a statue that is going to come to life. Some of the festival productions will have a modern staging, others something more like the Elizabethan model, and there will be some that will be different from both. No matter what any theatre group does with the sets, though, our friend, William Shakespeare, will shine through the production. I got an idea to do Shakespeare for kids in my neighborhood. Taming of the Shrew. Easy staging sounds like a gift. What else may I glean from your storehouse of wisdom as we look to begin auditions this weekend and rehearsals soon? I’m happy to learn anything. We are staging R&J and noticed your para about WS realistically removing bodies. How does Juliet get from her “swooning” bed to the catafalque? The end of ACT IV has all the principals walking off and the musicians discussing their money w/ Peter. J is still lying there. After the apothacary scene, it is suggested that the tomb be already set behind a curtain shielding the inner-under. How did J get there? Did J just walk off between acts-remember no blackouts in those days. Did he stage the bed in her bedroom in the inner-under and draw the curtains before the musicians scene? 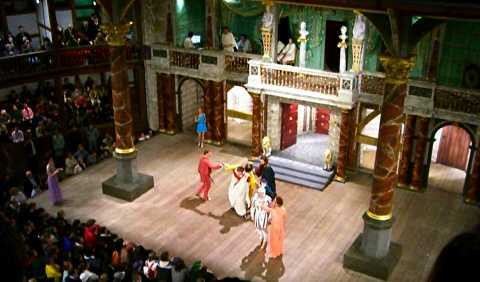 Hi Chip, the Elizabethans invented the flexible device of a rear stage for a range of purposes. It could be masked by curtains and allow props like beds and biers to be exchanged and allow the characters to come and go, entering and exiting through the back of the rear stage. Have a play around with the device and see if you can find a way that works for you. Best of luck with the production! Happy Birthday Shakespeare! Want To Understand Shakespeare’s Soliloquys?